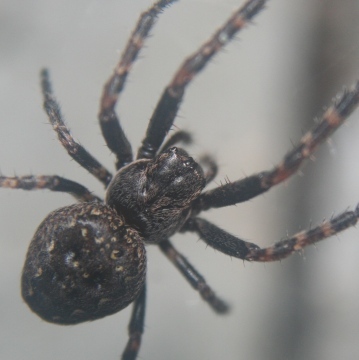 The Walnut Orb-Weaver Spider Nuctenea umbratica is widespread in Britain, but is scattered in the north and absent from northern Scotland. It is widespread in western and central Europe. The spider conceals itself under bark and in fissures in posts and fences during the daytime. In some areas it is a common resident of window and door frames. The body is flattened and this assists the spider to secrete itself in the cracks and fissures. Note also the broad blackish folium which extends the whole length of the abdomen, edged with white or broken into spots. This spider is nocturnal and builds a conspicuous orb web between its retreat and surrounding vegetation. Whilst the web is usually empty during the day, the spider can be found hidden away nearby. Adults of both sexes are found mainly between late spring and autumn, but females and occasionally males can be found during the winter.